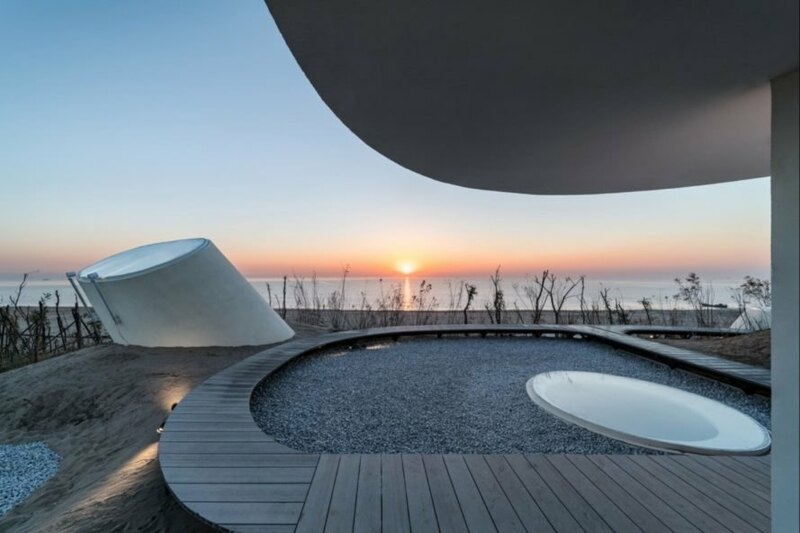 International firm OPEN Architecture has unveiled a stunning museum embedded into the sand dunes along China’s Gold Coast. 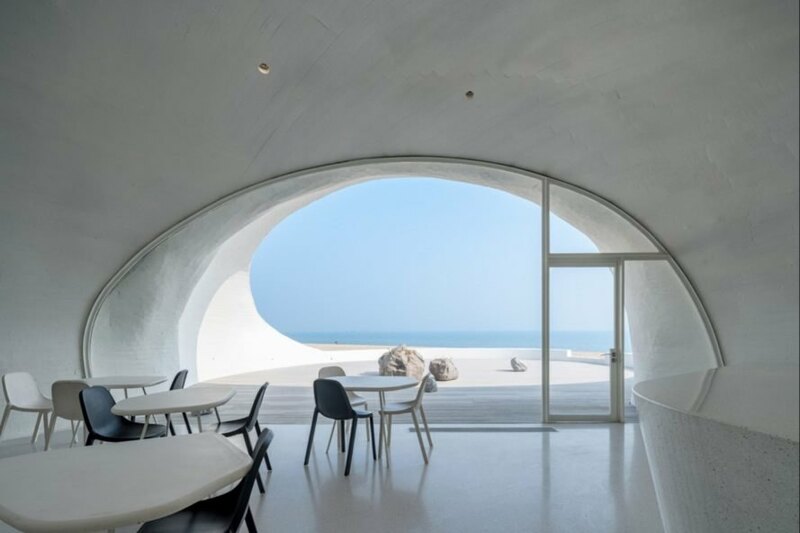 At 10,000 square feet, the UCCA Dune Art Museum is a massive structure, but its all-white cladding and various low, curved volumes tucked deep into the rolling landscape give the Ullens Center for Contemporary Art (UCCA) a modern yet unassuming character. 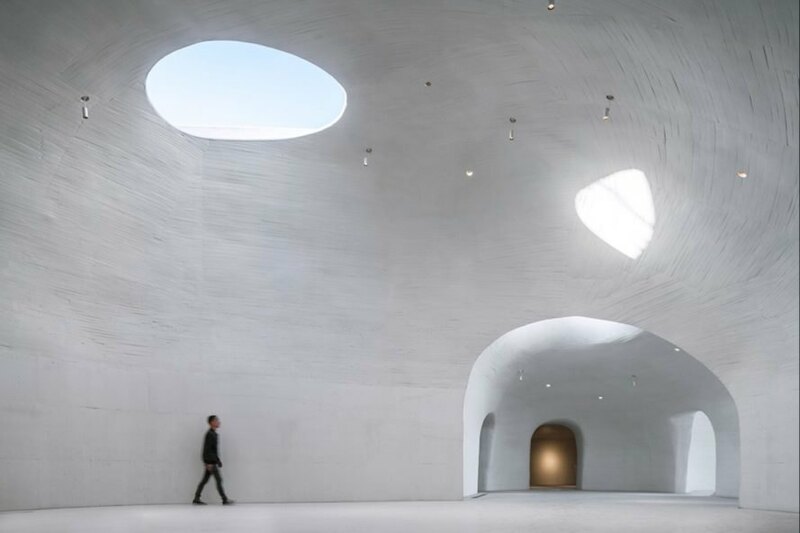 Located on the coast of northern China’s Bohai Bay, the museum was a labor of love for the architects, who spent three years carefully crafting the design to be as much a work of art as the museum’s collection. Embedding the structure into the sand dunes was a strategic decision to help protect the landscape from over-development. The unique space is comprised of various pod-like structures whose curved volumes were made possible thanks to small linear wood strips bent into shape. During the construction, the architects collaborated with local workers from Qinhuangdao, many of whom are former shipbuilders. The architects paid their respect to the handcrafted labor by leaving the imperfect textures of the formwork visible. 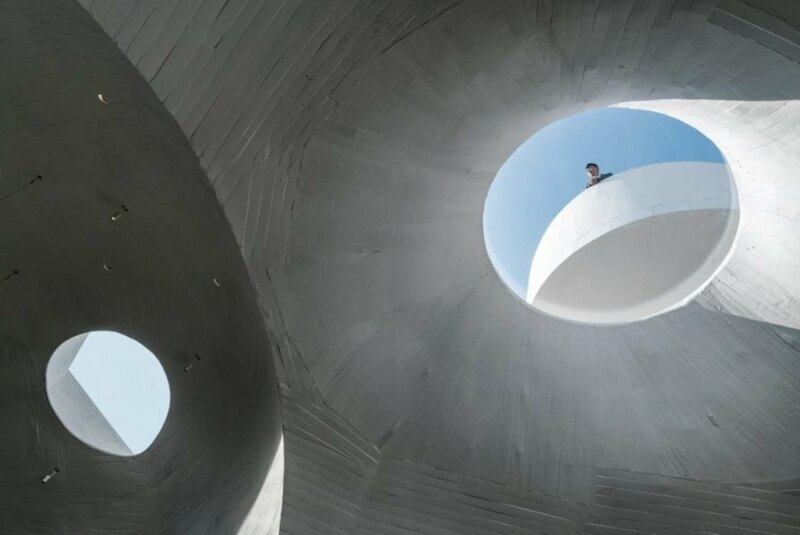 Covered in concrete and painted a stark white, the museum’s multiple roofs are finished with sand. This feature not only helped connect the design to the natural landscape, but it also helps to reduce solar gain on the interior. Additionally, the museum is equipped with a low-energy, zero-emissions ground source heat pump that keeps the building cool during the searing summer months. 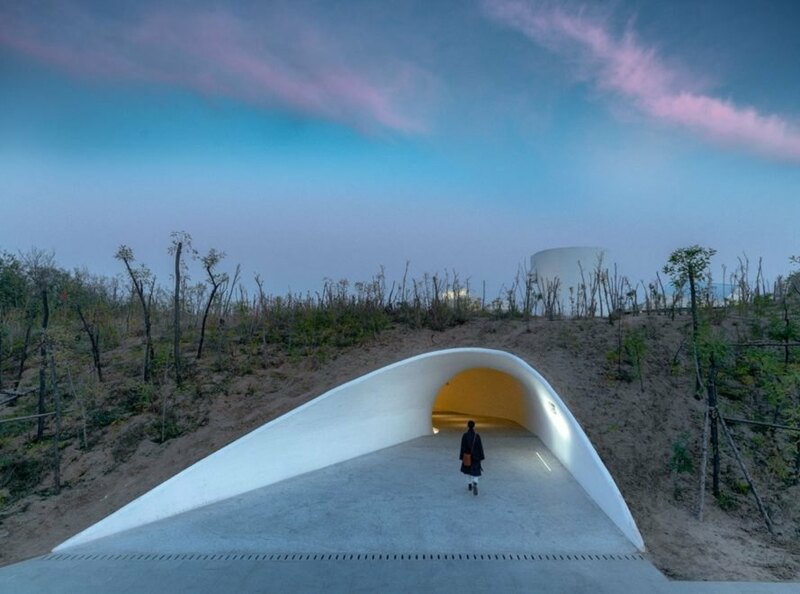 Embedded into the rolling sand dunes, the curvaceous volumes house the museum’s 10 galleries. Visitors to the museum enter through a long, dark tunnel and small reception area. Further into the structure, the exhibition spaces are made up of immense cave-like rooms clad in raw concrete. Throughout the interior, large cutouts in the roof and multiple skylights of varying sizes flood the galleries with natural light. 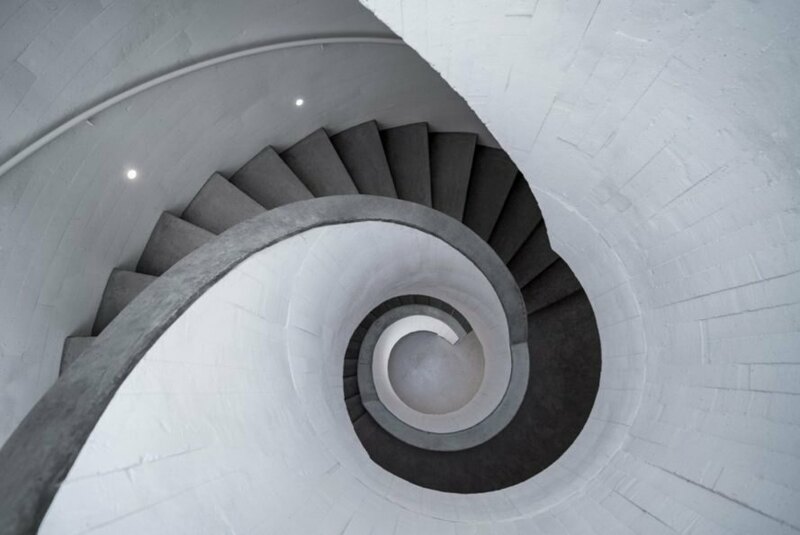 A large spiral staircase leads visitors from the underground galleries up to the museum’s open-air viewing platform as well as a cafe space. Here, guests can enjoy the stunning views of the sea. An aerial view shows the museum is embedded into the landscape. The main entrance to the museum is built into the dunes. The main gallery space is lined in raw concrete. Gallery skylights let natural light stream into the exhibition space. The museum cafe provides beautiful views. Rooftop pools look out over the sea. Multiple skylights were used to flood the interior with natural light. A spiral staircase holds court in the main building. The concrete design brings an industrial feel to the interior. 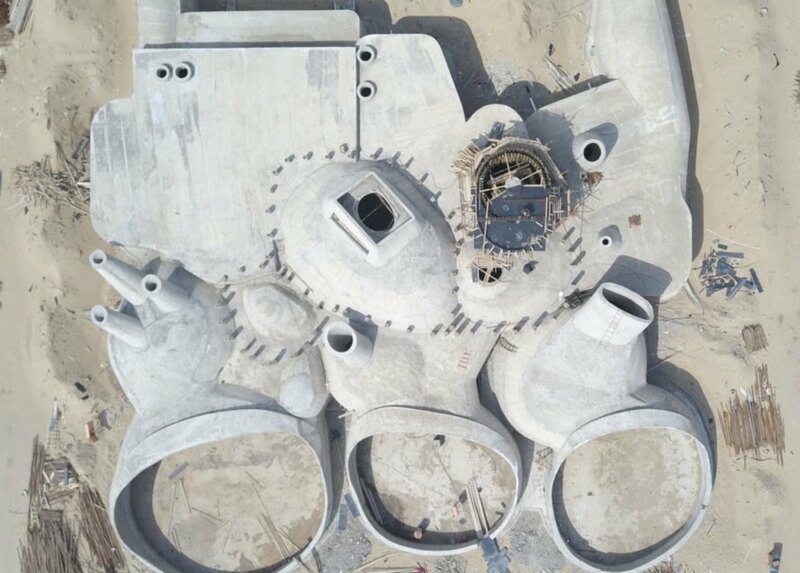 A look at the UCCA Dune Art Museum under construction.